One of the questions I get all the time is, what sewing machine should I buy? 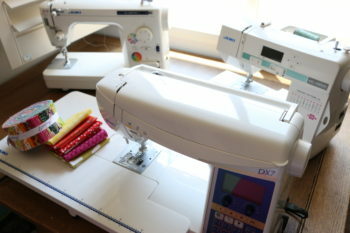 Here are some of the best sewing machine for beginners options. It can be very confusing with all of the different brands and features out there. One of my main recommendations is to buy it from a place that can help you down the road. Of course there is nothing wrong with buying a machine at a big box store, I know many who have done it! If you are going to make that big of a purchase anyway, I want you to consider getting it from a store that can help you trouble shoot should you need it. If you shop local, I also recommend asking if they service machines and if they do that on site. You want someone who is a sewing machine expert to be able to help you. All of these machines that I am recommending are under $300 which is usually the range beginners are looking for. My last 3 machines have came from Sew Mini Things in Florida. They offer free domestic shipping on all of their machines and are available by phone or email if you have any questions. If I can’t figure something out, I email Timm and he steers me in the right direction! It’s awesome! I asked him for his input as a sewing machine shop owner and these were some of his suggestions! 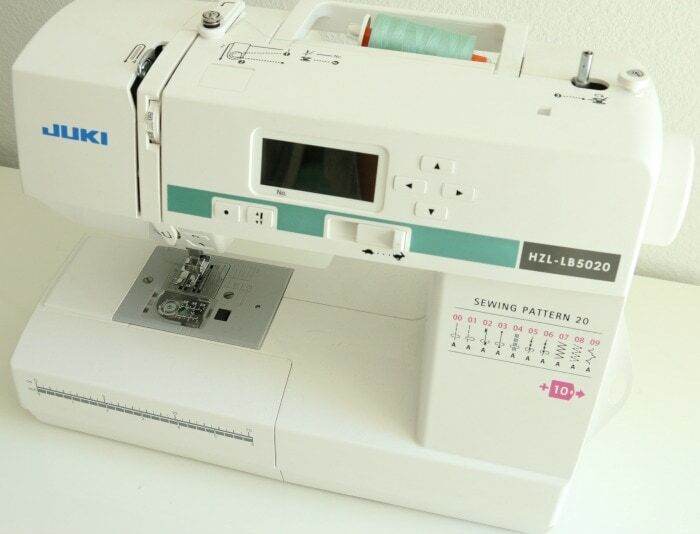 The sewing machine for beginners which I would recommend and personally own is the Juki HZL LB5020. I have fallen in love with the Jukis (I have to 2010q and the DX7) and this machine is my personal travel machine. It is light weight, computerized with speed control, start stop button, needle up/down button and 20 stitches. The machine retails for $499, but Sew Mini Things sells it for $299. For an entry level sewing machine this is a great option. When looking for a machine, it’s important to know the features it has and what you need to use it for. An apparel sewer will likely pick something different than a craft sewer or quilter. That being said having 1 very versatile machine is great as a beginner so that you are not limited. I love how portable this machine is. Now, if you have followed me for awhile you will also know that I like to recommend mechanical machines for beginners as well. If you are looking for mechanical, I like the Juki HZL-355Z ($ 279.) 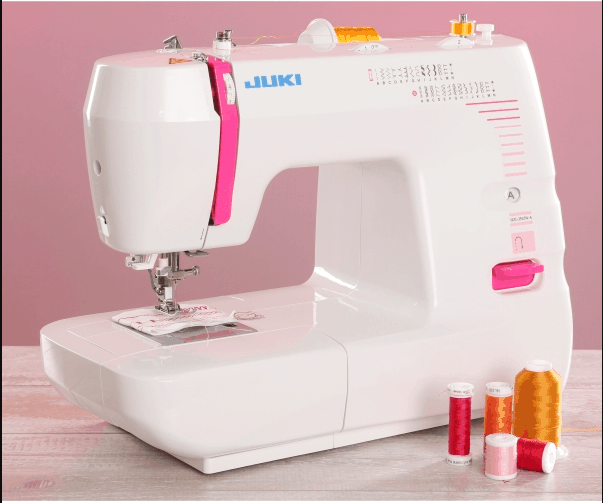 This Juki is a mechanical machine with 26 stitches and an automatic 1-step buttonhole function and they sell the machine for $ 279 ( which includes shipping). I like mechanicals for beginners because they are really easy to use. 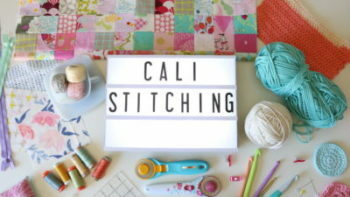 I tend to be a sewing machine minimalist and like that you can sit down and start without really reading the manual – although you still should lol! Timm also recommended the Necchi FA 16 ($269) for a good entry level mechanical. 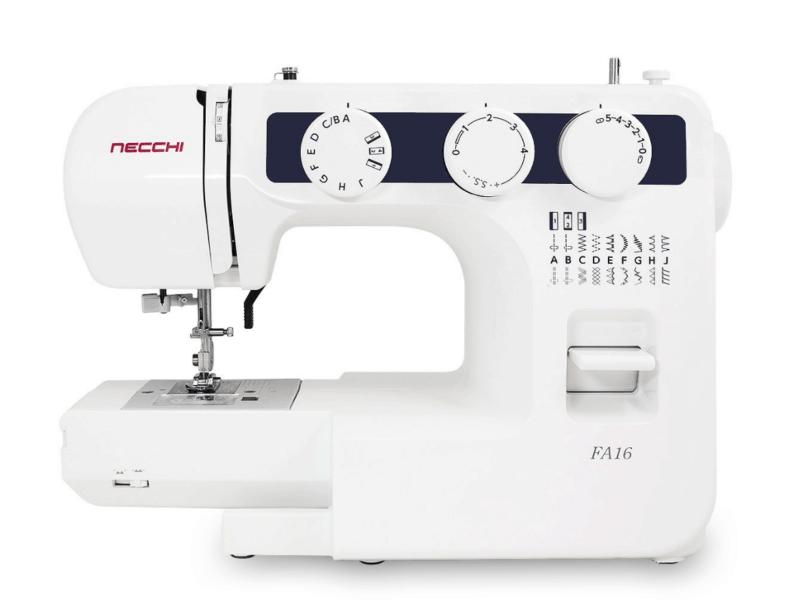 The Necchi FA 16 is a mechanical machine with 16 stitches and we sell the machine for $269 ( which includes shipping). 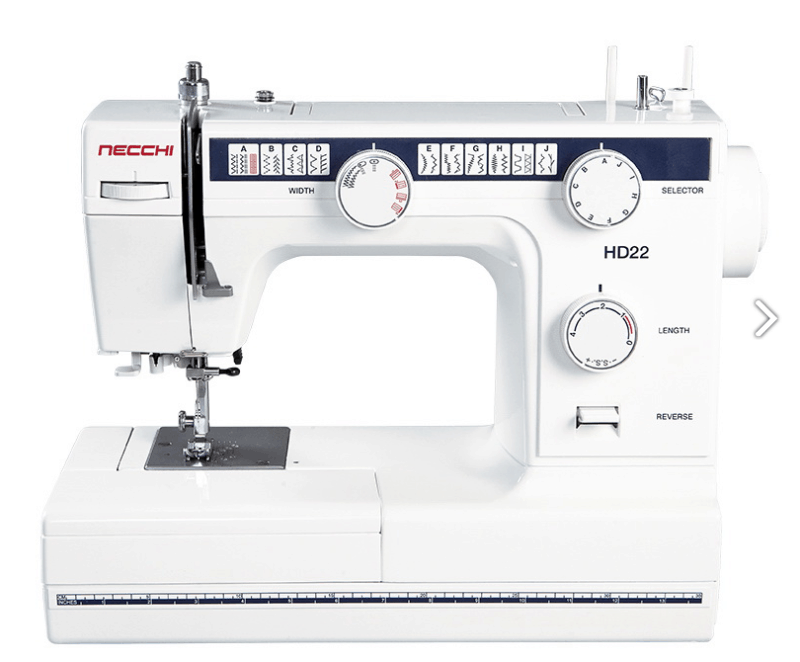 There is one other sewing machine that Timm suggested for those that might be looking at sewing bags, curtains or home decor items that are thicker and require a little more heavy duty machine which is the Necchi HD22. This one is a little over the $300 mark though and is $369. 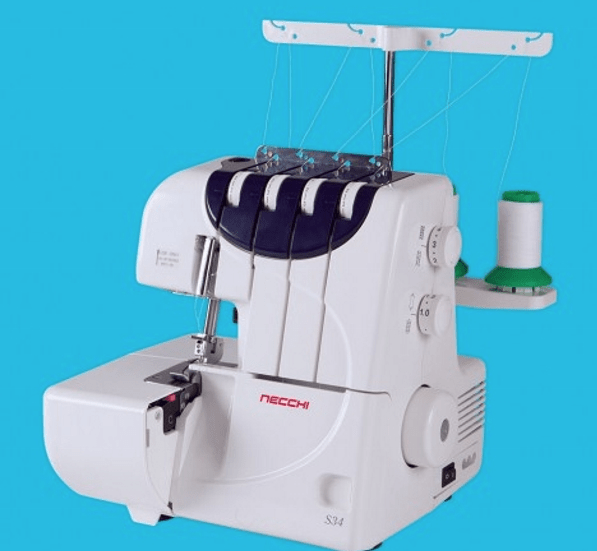 If you are in the market for a beginner serger, the NECCHI S34 SERGER which is 3/4 thread machine is great. It sells for $ 369 ( which includes shipping). 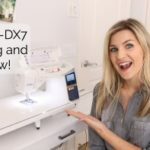 Was this sewing machine for beginners post helpful for you? Do you have any additional questions I can help you with? 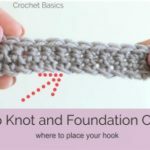 Need a beginner sewing tutorial to get you started? How about THIS ONE! 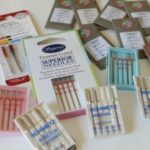 This post is not sponsored by Sew Mini Things, but I am an affiliate for them. That means I will earn a small commission if you purchase a machine through them. 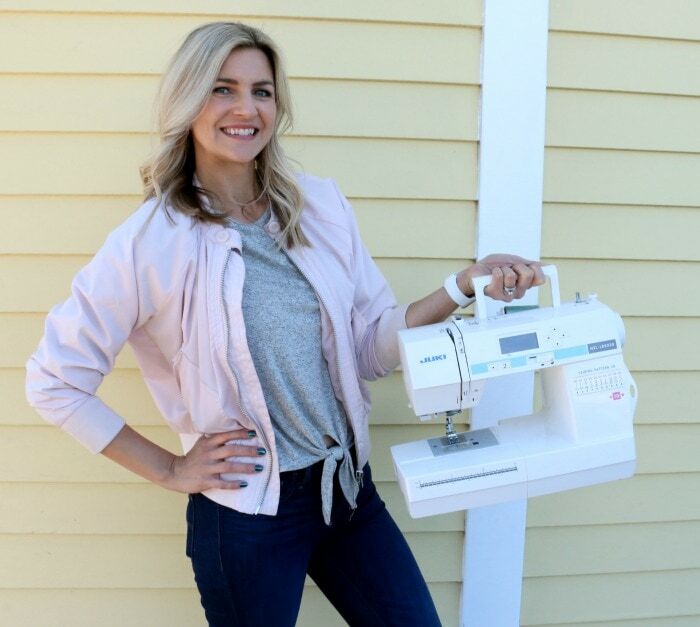 I truly think this is a great option for many of you and I am happy to recommend sewing machine experts that can help you! If you find this information valuable and decide to purchase a machine from them, would you let them know I sent ya?! I appreciate it and I know you won’t be disappointed ;). Hi! I’m looking for a sewing machine to replace my Brother Project Runway which I used to sew baby quilts. I see some of the Juki ones you’ve listed in your blog. 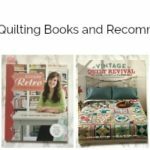 Since I sew mostly baby quilts and other kinds of projects, what would you recommend? Thanks! Hi Melanie, I was getting you emails regularly last year and then all of sudden they stopped. I talked to my sister in law as we both loved getting them and comparing notes. She is still getting hers. I just resigned up so hopefully I can get back on the list. I feel like I have missed some fun stuff. I know she is doing the basket weave pattern that your recently shared. Can u pleas send that my way. Thanks Julie P.S. Sometimes we get confused as both our names are Julie Dunbar but we do have different emails so maybe someone thought that the same person was getting double the emails. I have been watching your videos and leaning from you for two years now. I am a big fan! I now am able o crochet as a result. I have also been attempting to learn how to sew. Can you please provide a video in which you thread a sewing machine? Please keep making videos!